As I came away from the recent Voynich 100 Conference at the Villa Mondragone in Frascati, Italy, I found myself thinking of some old problems in new ways. Probably most useful to organizing my thoughts was my interview by Lisa Jackson and Bob Aschmann , the Sunday after the conference. Being asked some old and new questions, so soon after meeting and discussing everything Voynich under the sun, allowed me to organize my thoughts in some new and different ways. It was a sort of Voynich-therapy session. One question was why the Voynich has not been solved. I mean, in extremely simple terms, one might say, “Because it is really, really, hard”. But the question is, what makes it different than other hard problems? Why have the usual tools of scholarship been unable to crack this one? Or, unable to define it at the very least, if one accepts that reading it is not the paramount problem? I mean, we don’t even know what it is. Well, there are those who will tell you they do know what it is, and what it is not, of course, usually adding the “unusual” disclaimer before the suggestion. But really, no one is satisfied, or this would be over. So why don’t we at least know what it is, with certainty? In the interview, my answer to the question “why?”was, “because I believe the Voynich resides outside of existing scholarship”. Scholarship does not experiment, it does not imagine. It only compares, contrasts, and catalogs. In almost all cases, this works, because almost all of the world, and all of the knowledge within it, exists somewhere in known scholarship. But perhaps, not in the case of the Voynich- and this would then explain the loss of scholarship to explain it. “What the Voynich really is” is not in there, and so, scholarship cannot solve it. It certainly has not, and perhaps will not, ever. I’ve often wondered why mainstream scholars have rejected various concepts I have proposed, and rejected some seemingly (to me) reasonable, common sense proposals of others. I could not understand why optics and fantasy were lumped in with aliens and crop circles. And then, at the same time, those same scholars have accepted some other, seemingly (to me) bizarre concepts… which I will not relate, here. But I could not equate the two seemingly disparate judgments. Now, I think I have a clue as to why. I think my inability to understand this effect, this “disconnect” as I see it, was in my looking at all the ideas suggested for the Voynich, all the theories, on a sliding, empirical scale of “normal” to “bizarre”, while at the same time, failing to see one important, divisive, distinction: Ideas accepted by scholars and scholarship, no matter how outrageous, are assembled from examples from existing scholarship; rejected ideas always exist outside of accepted scholarship. And “outside of scholarship” to a dedicated scholar, simply means it cannot be. Without a category or existing example to compare it to, scholarship believes an idea to be impossible. Well, I can compare to various concepts within scholarship, but not to existing examples, and certainly as a whole, my ideas do not fit in any existing category. I suspect optics, for instance, and it is rightly pointed out there is no other 1610-1620 optical manuscript, or even a place for one. I see old vellum use, post C14, and I’m told the scholarship does not allow it, as such a situation is rare, or unknown. There is not yet a category for works on old vellum, and when examples are found, scholarship tends to digest them as errors, or unimportant anomalies. “Purple Cows”, so to speak. And when I see a manuscript created as an artifact of scientific, utopian, fiction, as a sort of “living Book M”… it is correctly pointed out I can’t find another actual work to compare it to. Again, there is no category for such a document, as no such work is known to exist; they are only described in fiction. And when I show other works which were created to look like older texts, such as the Chittenden manuscript, it is pointed out, accurately, that they exist in their own category, which my specific case does not fit. And of course, scholarship will not create a category for what I suspect the Voynich is, “An Artifact Born of Scientific Utopian Literature”, until it is proven. I understand that. And therefore it is a vicious circle, a “Catch 22”, for my theories and proposals. I made a PowerPoint slide for the very end of my Voynich 100 presentation, which I erased the morning of the Conference. I have since been sorry I removed it. At the time I wanted to limit my presentation to three basic concepts. The erased slide was presenting a fourth, although a simple one, and entitled, “The Antikythera Mechanism of Manuscripts?” The Antikythera Mechanism is a Greek device, a highly complex, geared mechanical astronomical computer, now dated to the first century BCE. Before it was found, it was not known that the Greeks, or any culture for that matter, would be remotely capable of building such a thing in its time… and actually, incapable for at least another 1800 years. The entire scholarship of the Greeks, of science and proto-science, and of astronomy, and gear mechanics, did not have a category for such a device. When found, it existed outside of known scholarship. It has occurred to me, that if the Antikythera Mechanism were dropped into the lap of existing scholarship like a hot potato, without the shipwreck it was found on, scholarship would have failed to properly identify it. We would have been told that it was probably a highly advanced 19th century device. This, because there was no category, when found, for a first century BCE, complex, geared mechanical astronomical computer. In fact, scholarship created that category only grudgingly, as many at the time of its discovery believed the device must have fallen on the BCE wreck much later. And I will point out that the Antikythera mechanism is the only device in the very category made for it. It is stunningly, brazenly, truly: one of a kind. Unique: Like the Antikythera Mechanism? 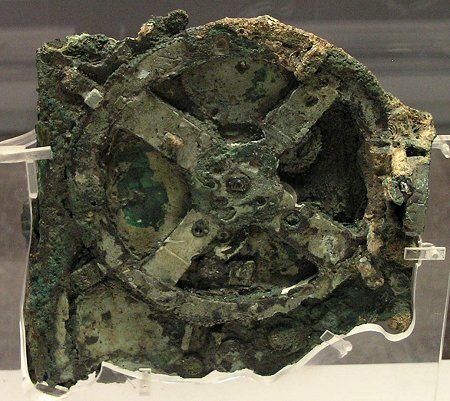 It may be pointed out that the shipwreck, on which the Antikythera Mechanism was found, does in fact date the device. And this means that existing scholarship, in the form of marine archeology, has worked in that respect. And further, it might be suggested that there is an analogy between the shipwreck and the Voynich C14 dating… and claim, again, that scholarship, with the acceptance and knowledge of carbon dating and dendrochronology, has worked in our case. But I might counter that both the errors I, and others, have found in the assumptions of “use of old vellum practices”, do easily allow that that the Voynich could have been made on old vellum, that the current provenance and ink tests on the Voynich do not disallow this, and lastly, that to ignore the striking resemblance of many Voynich cylinders to early microscopes, is, in effect, ignoring the scholarship of early microscopes, and failing to use it as a comparison. And ‘round and ‘round we go, again. I can find, within existing scholarship, exceptions to the arguments against my theory. But without a category to place the Voynich in, as I envision it, or actual examples of what I propose it is, those exceptions will not be allowed by scholarship. So what is there to do, as I pursue this? Of course I will continue to use known scholarship for research. Although I feel it has not managed to give an answer, nor accepted mine, so far, I do hope that I may find some other such artifact as I suspect the Voynich to be, mis-categorized, or not as yet categorized. Perhaps there is some book, object, or device, or description of same, which also sprang from the same influences I suspect influenced the creation of the Voynich. And if so, maybe it will turn out it is not alone in its own box, as the Antikythera Mechanism certainly is. But meanwhile, while looking for that example, or waiting and hoping for a translation which puts the question to rest, I will look at the Voynich in the category I have created for it. Perhaps my new category will never be accepted, and no other examples ever be found, and perhaps the Voynich will never be proven to be what I suspect it is. And it may very well not be that thing, of course. But I still am not satisfied with anything on the list of proposals that existing scholarship will accept, or has proposed, so I must continue to look elsewhere. The Chymical Wedding: Parallel Work? The 1616 book, The Chymical Wedding of Christian Rosenkreutz, is the third of the first three defining works of the Rosicrucian movement. It describes the progression of the fictional Rosenkreutz through a series of allegorical events, while encountering fantastic people, finding mysterious cipher writings, and witnessing bizarre, surreal scenarios in which Rosenkreutz was often an unwitting participant. These events explored, through allegory, various political, religious and ethical questions. At the same time, they symbolically reflected various alchemical processes… not all of which are entirely clear to us today. To better understand this entertaining work, I would recommend the 1991 Phanes Press edition, translated by Joscelyn Godwin, with excellent commentary by Adam Mclean. Although printed in 1616 for the first time, The Chymical Wedding of Christian Rosenkreutz was actually written sometime after 1605 by Johannes Andreae. What most interests me is that, although openly published in 1616, it was released under the premise that it took place, and was written, in 1459. It can be accurately described as a fantasy book, written between 1605 and 1616, pretending to be over 150 years older than it was, using cipher to enhance it’s aura of mysterious, ancient lore. I came across the Chymical Wedding while researching the Rosicrucician connections of the people of my circle of interest, and was surprised just how immersed in this world they were. I do not hold stock in the premise that Francis Bacon was a leader of the movement (nor, of course, the discredited claims he was Shakepeare, for that matter… I am firmly a Stratfordian on that issue), but there is no doubt his works reflected some of the tenets of Rosicrucianism. In fact the work in question, The New Atlantis, reflects several principles, and some of the iconography, of that philosophy. So of course I was doubly surprised to find that one of this circle, Andreae, was not only a follower of the tenets of the movement, but also claimed to be a writer of one of the chief documents. Years later, Andreae referred to this work as a “ludibrium” of his youth. A controversial statement which has been interpreted in several different ways. I won’t go into all of them here. To learn more about Andreae and Bacon’s possible roles and motivations relating to Rosicrucianism, do not miss reading Francis Yates’ The Rosicruician Enlightenment. Selenus was another remarkable person, in a vast ocean of such remarkable men and woman from this very intellectually rich moment in history, who seems to have influenced almost everything we know today in some profound way: from industry to religion to politics to gaming. The Duke needs his own forum for a proper showing, but for the purposes of this blog, and this investigation, suffice it to say he wrote on, and expanded, the knowledge of cipher in surprising ways. I have one of his adapted codes as a suspect for a Voynich code, and I will write on that shortly. But for the time being, note that Andreae was fairly immersed in cipher, in Rosicrucianism (if not it’s true originator, at least, one of them), in the premise of utopia, and knew the powerful and valuable impact the aura of ancient mysteries had in pursuading people to look to his works for answers to a myriad of problems of religion, and of “science” and society. Whether or not a “ludibrium”, the works of the RC movement did draw believers, and followers, and many throughout Europe looked hopefully for the invisible disciples of the Invisible College. And, I propose, the Voynich Manuscript could be one more document of this type, also filled with cipher, meant to look older than it was, and meant to look mysterious and alien to the European circle hungry for such productions. A book such as this, a tome from the fictional island of Bensalem, would be a near parallel in intent and execution… although, so far, unreadable… to the known contemporary example, The Chymical Wedding. “…we have some parts of works which with you are lost, namely the Rosie Crucian M, which he wrote of all things past, present, and to come”. We might ask “of what importance?” is Heydon’s later interpretation of The New Atlantis? Yates and others saw his view of the work as the intent of the work, and also how the work was perceived in his time, i.e., as a Rosicrucian document. It is considered that Bacon, or his friend and posthumous publisher, in being cautious, stripped The New Atlantis of the most obvious and direct Rosicrucian references. James I would not have been open to such RC references and connections. The later John Heydon can be seen as having returned, or added, originally references which reflect the intent of the work. Now imagine if a faux book were created, meant to look either like the Book M, or the Book of Solomon, from New Atlantis, between about 1610 to 1620. Would it not have a look of mystery, and yet contain many plants, and scientific devices, both familiar and yet somehow mysterious? And contain both borrowed and invented bits of astrology, astronomy… all perhaps Hermetic-inspired, but enigmatic illustrations of these themes, nonetheless? And in addition we know that if such a book were created, it would need to be written in a “magical language and writing”, in order to accurately reflect the fictional original. And it would, to complete the effect, have to be made to much older look than it really was. But unavoidably, it would possibly give us a sense, today, of a “newness”, because it would be difficult to mimic exactly the look of a book one to two hundred years older. We can only imagine it, because so far as we know, no such book has been found. And if the Voynich is such a book, it would be the first, with nothing exactly like it to compare it to. Of course I am struck by the inclusion of “looking-glasses of divers virtues”, as they are clearly not referring to glasses simply as corrective vision, but either telescopes of microscopes, or both. Optics both as devices and a concept ran through the philosophies of the time, and were a tool of the new movement toward inductive reasoning. The tomb of Rosenkreutz and the New Atlantis contained optics for much the same reasons: for what they meant to the new concepts promulgated by the Rosicrucian movement. And, as I personally would argue, why I believe optics may have been included in the Voynich. Looking at these fantasy cipher tomes: Book M, The Book of Solomon from Bensalem… and remember, Prospero’s books: I’m not so certain, if all three of these faux books were created in 1610/20, that we would be able to tell them apart today… or, for that matter, apart from the Voynich Manuscript. And if the Voynich is one of these books, everyone has been looking for answers in the wrong places, which would then make it unsurprising that no answers have been found. It is just plain bizarre. The page includes the Voynich’s usual disregard for scale, and it’s usual flamboyant decoration. But it is clearly a place, as it has towers, castles, houses, walls, terraces, walkways, columned buildings, courtyards, and what could be fountains. There are terraced heights. It appears to be surrounded by water, making it an island, or an island continent. In my opinion, it is certainly not a not a real place, and not meant to be. But if it is not a real place, then it is fantasy place, or, “no place”. More exactly, it is a Utopia, because that is exactly what the word means, as first coined by Sir Thomas Moore for his 1516 book of the same name. The points to this post are twofold: First, as I wrote, that I feel that the rosettes page is meant to represent a fictional place, and second, that such a concept was very familiar to, and reflected by, the people of my suspected circle of influence. Here are some of them, with copy and illustrations adapted from my page on Utopias. There are links to some larger versions on that page. Above is Thomas Moore’s Utopia from 1516, although I am not sure of the date of this illustration. 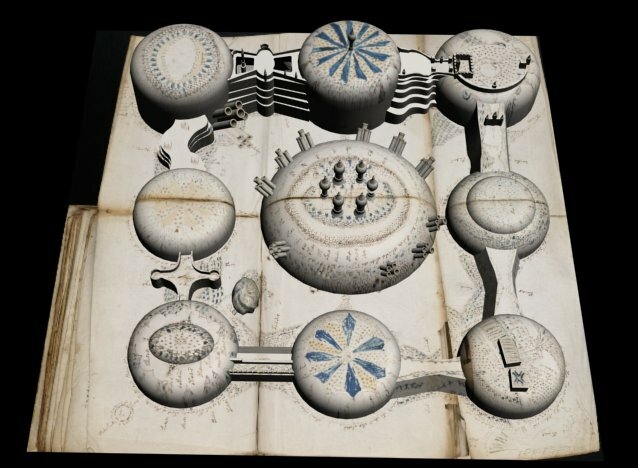 Just like the Voynich’s rosettes map, you have Utopia surrounded by seas, with castles and buildings. Also of note is have the unique written language of the island, in cipher. 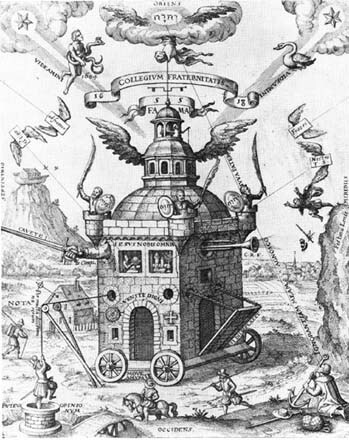 The above engraving first appeared in 1609, to illustrate the earlier Civitas Veri, or City of Truth by Bartolomeo Del Bene. We have here a utopia with towers, walls, castles, walkways, courtyards, orchards, and so on. From the excellent blog, Giornale Nouvo, which has extensive information on this work, and many others. Above is Johannes Valentinus Andreae’s Christianopolis. Published in 1619, but the date of composition is unknown. I was first drawn to Andreae by a seemingly curious coincidence. He admitted to being the author of The Chemical Wedding of Christian Rosenkrantz, published in 1616. This is the third of the three fundamental and influential works of the Rosicrucian movement. The fact is that the Chemical Wedding parallels my New Atlantis theory in a notable way: It is a book written in the early 17th century, but which was intended to look as though it had been composed much earlier… 1459 in this case. This is quite what I am proposing for the Voynich… that it is an early 17th century work, made to look much older. Think of the coincidence: We have here a man who wrote his own utopia, and probably wrote one of the three Rosicrucian manifestos, when Francis Bacon wrote a utopia, arguably containing references to Rosicrucian imagery and themes. Above is The City of the Sun, 1602, by Tommaso Campanella. I have read somewhere that a man smuggled the manuscript for this work out of prison for Campanella, while he was incarcerated. The smuggler? Johannes Andreae. Above is an illustration of Bacon’s New Atlantis. I’ve been unable to find the original source of this image, or the edition of New Atlantis it came from. I do not know the date, but suspect it is much later… possibly even, modern, in a faux 17th century style. The artist attempted to include as many of the fascinating inventions and discoveries found in Bacon’s landmark utopia as possible: Telescopes, microscopes, automatic fountains, hybrid plants and animals, and much more. Also note the large central castle, which seems to be the House of Solomon. Update, as of October, 2011: Dan Wilson tracked down the artist, and the source, of this New Atlantis illustration. It is actually a 1970 drawing by the artist Lowell Hess, and appears in the book, “Graphic Design for the Computer Age”, by Edward A. Hamilton. From the book, “A profusion of fascinating details in the picture at right represents scientific wonders mentioned in Sir Francis Bacon’s The New Atlantis. Artist Lowell Hess, simulating the 17th-century engraving style, has extracted from Bacon’s prophetic guesswork such surprising ideas as a telephone (n) and a laser beam (e). The drawing is lightly humorous.” Although the drawing is modern, I do feel that the spirit in which Mr. Hess drew it, inspired by Bacon’s work, may be a parallel inspiration to our unknown, Voynich artist. Be sure to check out Dan Wilson’s thoughts on possible sonic meanings in the Voynich, also, at his site. As you see, representations of utopias were all the rage during the time frame I propose for the Voynich (1610 to 1620), or close to it. Only the original work by Moore predates that range by a significant amount. More importantly, the utopia was often used by the people of my circle, or reflected the sciences and tenets they held dear. I contend that it should not surprise anyone in the least to find one more illustration of a utopia emerge from this time, by these people, for reasons we already know motivated them in similar pursuits… and that the Voynich’s rosettes, which is arguably “a” utopia, may be a map of “the” utopia, Bensalem, from Bacon’s New Atlantis.